Hitachi is a name well known to consumers. The company makes countless products for both consumers and business. The device pictured above is from their line of portable hard drives. The SimpleTOUGH line is designed to be exactly what the name implies. The USB 2.0 drives are simple to setup and use while being tough and durable. Anyone who carries a portable hard drive (and I've been known to carry a few) will tell you the number one fear for data loss is dropping the device or having it bang around inside a bag or backpack. The constant wear and tear these things can receive simply by being transported is much more than most people imagine. We live in a rough world so why not take your data with you? SimpleTOUGH is the ultimate in durability and data safety, all in a ruggedly handsome design. Made with a rough and tumble lifestyle in mind, SimpleTOUGH features ergonomic sides for easy carrying, velvety smooth rubberized body, an integrated, flexible USB cable (you’ll never forget the cable again!) and a cool topside LED. But don‘t be fooled by its stylish exterior! Designed and constructed for an active lifestyle, SimpleTOUGH won’t let you down. 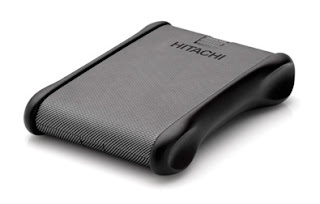 Award-winning Hitachi disk drives ensure that your data is safe and sound. Just plug one in, and inside you’ll find smart ways to protect and manage all your precious stuff. SimpleTOUGH features both local and online backup for unbeatable, total protection. With Hitachi Local Backup software, you can set up automatic backups from your computer to your SimpleTOUGH, while Hitachi Ultimate Backup (2 GB fee) provides secure, online backup that’s safe from real world mishaps. It works in the background, for constant, near-real time protection without bogging down your computer. You’ll not find tougher or more stylish portable storage than SimpleTOUGH. Backed by the Hitachi brand of reliable and fast hard disk drives, SimpleTOUGH delivers on its promise to “Inspire the Next”. Now you can rest assured that your valuable data is protected by the leader in storage.